Thunder and lightning breaking a heat wave tonight… it was a sultry day thus perfect to review this frank and frisky take on seduction. The first move comes when you convince yourself you have a chance and you dare. 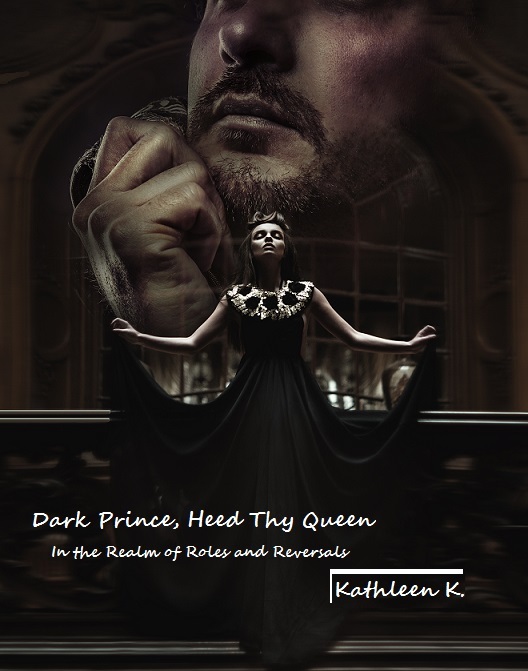 Dark Prince, Heed Thy Queen is the twelfth book from my Private Publications available September 2014 in print and Kindle at KathleenKBooks.com. There’s another post in this series that describes completing a manuscript, Putting Honey B., Sexual Consultant, to Bed, which I reference here in its entirety. Each book is another statement piece for my rowdier readers. He might plan the battles but she was winning the war. SAMPLE – for illustrative purposes only. Amateur readers may not be amused. His name was Nathan, provocative Nathan… Nathan, my Dark Prince. Nathan is dense and dreamy, he fills out his jeans, he has square shoulders and a powerful torso, his face is unremarkable but his emotions use that blankness to telegraph messages to people. He projects himself at you; you are shown what he wants you to think he is feeling. He stays on tight focus when he is being intimate but otherwise he’s on wide broadcast. People know when such a man is in the vicinity because nature makes it so. You hear his walk, you catch his body language. He asserts himself without challenging others. His hair is thick and curly, he can make it behave when he wants to but he doesn’t always want to. It will droop in his eyes when he’s thinking. He has a beard, a rough-looking scruff outlining his face, not overly manicured. It grows the way it does to fit the face he has, it emphasized his lips and the strength of his temperament. I didn’t know where Nathan got his money. It didn’t matter to me, I didn’t rely on it. I had my own money. He had his living quarters, I had mine. Ours was not a relationship built on facts from “real life”. We were lovers and our world was our own. I couldn’t let that man go. I would, from time to time, contrive to avoid him. As a gentleman, he took the hint and laid low. I’d do my best to be busy, or relaxed, or whatever plan I had for a particular bout of leave-taking. It was always me that called him, he honored my decisions better than I did.